When you are traveling to China you have to visit its capital Beijing. It’s an amazing city with a long history and sights that you just have to see. 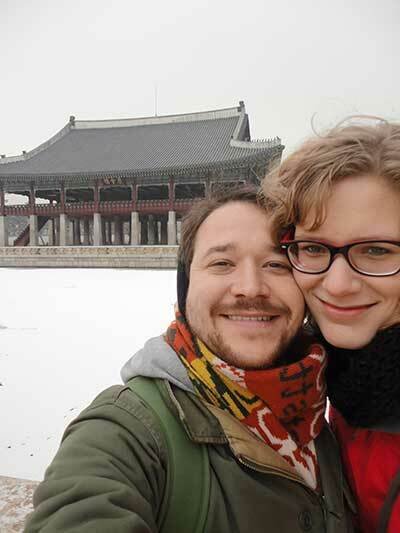 We think that 4 days in Beijing will be enough time to see all the highlights and wander through this enormous city. We’ve been living in Beijing for over 2 years and in this blog post we will give you an idea on what to do when you have 4 days in Beijing and on how NOT to spend all your money. Prices are for solo travelers. For a room (double) you will spend about 100 RMB per night, per person. Although you will spend 4 days in Beijing, you will only sleep there for 3 nights. The total costs for your stay at a hostel will be around 300 RMB. 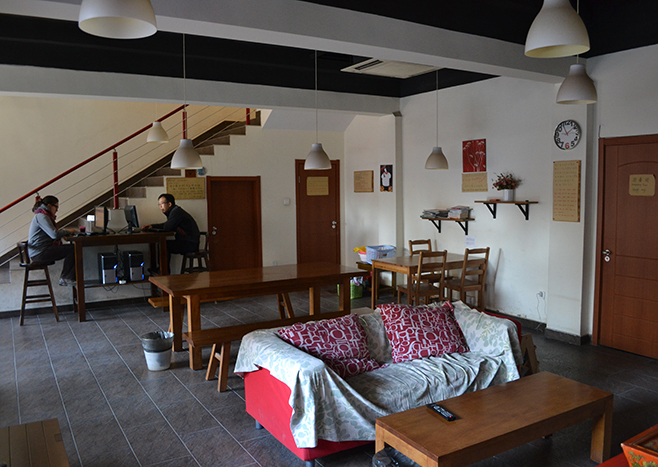 There are cheaper options available, but hostels with lower prices tend to be further away from the city center. Also, chances are the quality isn’t a good. Personally we value our sleep, so we are willing to pay a little more if necessary. You’ve arrived in Beijing by plane and want to go to your hostel. The easiest and cheapest way to get from the Beijing Airport to the city center is to take the Airport Express. At the airport, you can buy a ticket for 25 RMB and that will take you to the center. From the final stop of the Airport Express you will take the subway to your hostel. The subway is the easiest, and again, one of the cheapest ways to get around in the city. The price of a ride depends on the distance of the ride, but most rides will cost you 3 or 4 RMB. If you take 6 rides a day, 4 days in a row, that will cost you about 100 RMB. There is no need to take taxi’s; they cost a lot and chances are you will end up in a traffic jam. Just like accommodation, spending money on food is very personal. You can spend a lot on food if you would want to, but it’s also possible to eat cheap and save money that you could do other things with. In Beijing, you can have a meal for under $5. Especially breakfast can be very cheap here. I am usually stuffed after a few baozi or breakfast dumplings and some soy milk. Total costs, 10 RMB. For lunch you can hop in to one of the many small restaurants that you will find pretty much everywhere. A dish with rice and vegetables or some noodles doesn’t have to cost over 20 RMB. As foodies, we often splurge a little during one of the meals, so for dinner we would order 2 of 3 dishes with some rice and a drink. This would cost you somewhere between 50-75 RMB (for one person). 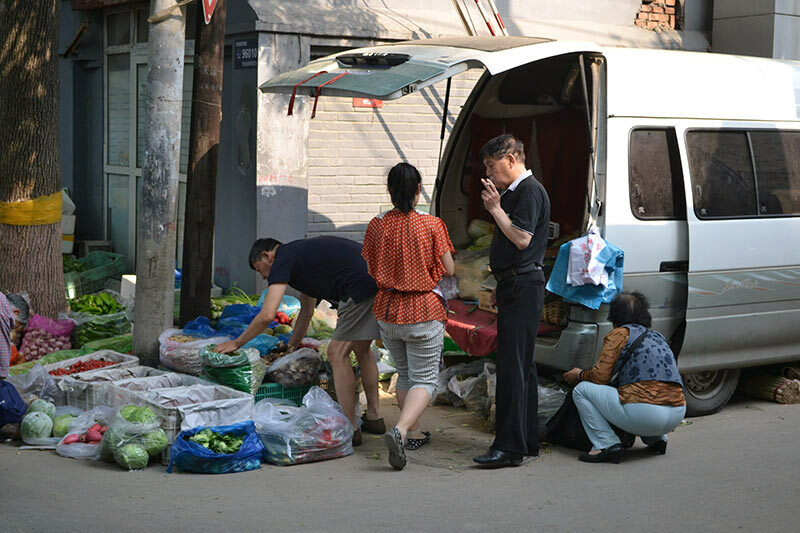 Altogether, meals would cost you about 100 RMB per day. You’re in Beijing 4 days, so 400 RMB altogether. I will round it up to 500 RMB for the costs of water and snacks that you will be buying during the day. 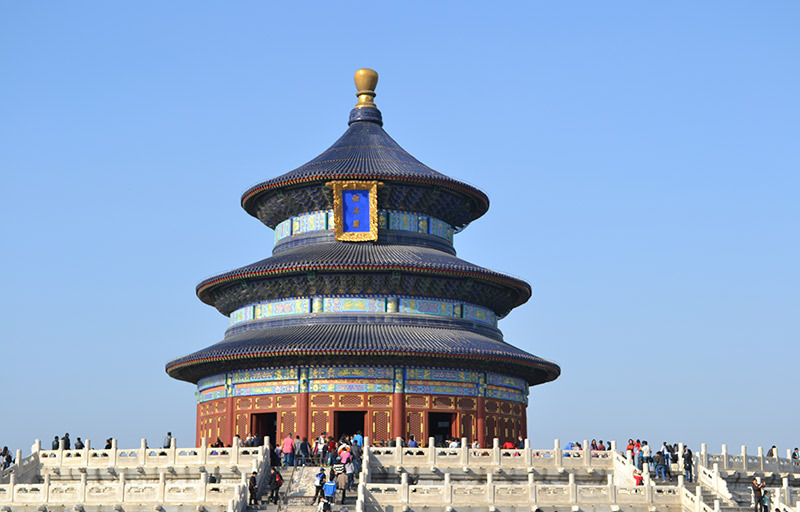 You will be waking up early today as your day will start at the Temple Of Heaven (30 RMB). It is one of the temples that the emperor would visit during the summer. The temple was built during the Ming Dynasty, in 1420. It is not only a temple, it is also one of Beijing’s biggest parks, this makes it a great place for local people to exercise, dance, or practice Tai Chi. This is the reason you’ll be going here in the morning: most Chinese will go here in the morning too. After a few hours in the park, it’s time for lunch and the Forbidden City and Tiananmen Square. Walk over the square and be amazed by its size. To avoid some of the queues, you’re heading to the east or west entrance of the Forbidden City. You can walk there or take one of the green trams (15 RMB) that will drop you of. A ticket to the city (60 RMB) will give you entrance to the place where once emperors lived with their concubines and eunuchs. In the evening you could go to WangFuJing Xiao Chi Jie, relax in your hostel, or, if you have the budget, go to the Beijing Opera. Today it’s time to climb the Great Wall. It’s simply not possible to go to China and not see the Great Wall. Mutianyu is a part worth visiting, as well as some other parts (definitely not Badaling). Hostels often offer day trips to the Great Wall, but if you’re a bit more adventurous you could choose to do a tour with for example the Beijing Hikers. They take you to a remote part of the Wall for a day of hiking. It’s a bit pricier (about 400 RMB), but we think it’s money well spent! If you have energy left you can head out to Sanlitun or Houhai Lake to party with Chinese and / or other travelers. Today we’re starting a bit later. When we travel we like to take it easy instead of rushing to all the sights that we want to see. That’s why sometimes we take it slow. It’s vacation after all, isn’t it? 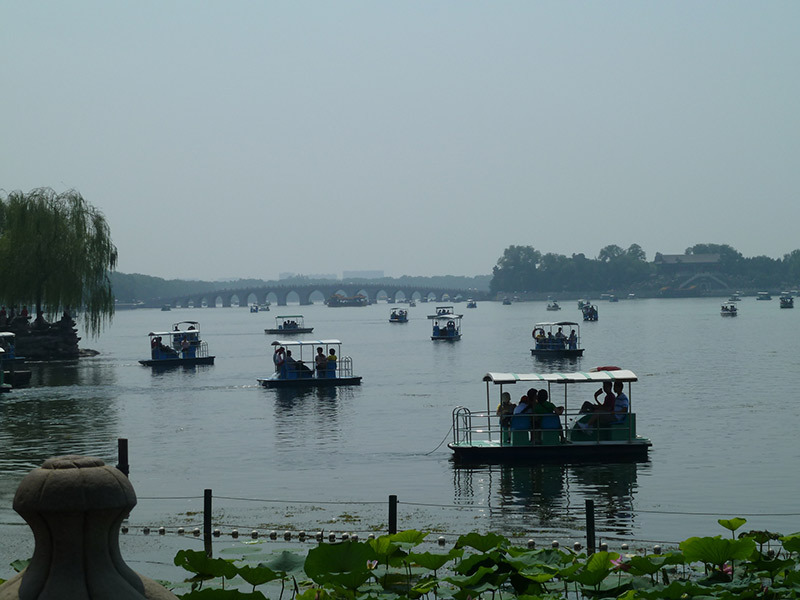 Late morning, early afternoon you will be going to the place where Emperor Dowager Cixi liked to spend her days; the Summer Palace (60 RMB). Since summers in Beijing can get really hot, emperors would leave the city during summer and enjoy the cooler air in the countryside. There are different parts of the Palace that are open for visitors and there is a lot to see. In the evening we would recommend having Beijing Duck for dinner. It’s a local and traditional dish, so something you can’t miss! Beijing isn’t only famous for its duck or the Great Wall, it’s also known for its hutongs. So, on the last day of your 4 days in Beijing, you will be exploring the hutongs of Beijing. Although a lot of the hutongs have been replaced with apartment buildings and hotels, there are still a few places throughout the city where you can find the authentic hutongs. The area between the Forbidden City and Nanluoguxiang / Houhai is fun to explore, and so are the hutongs in the Qianmen area and around the Lama Temple. Here you will see the slow life of the ‘Lao Beijing Ren’ and here you will experience ‘the real China’. The hutongs are good for hours of exploring with everything that’s happening. Others would cover the costs of the tickets for the Beijing Opera, drinks at one of the bars and / or the Beijing Duck. Altogether, the costs for 4 days in Beijing would be 1950 RMB, a little over $300. It’s not exactly a backpacker budget, but than again, Beijing is a capital city with prices that belong to such a city. There are ways to spend less, but for us, that would take away from the experience. Hopefully you’ve gotten an idea on how to spend 4 days in Beijing and how you could be spending your money. If you have any questions on traveling to Beijing, feel free to contact us.